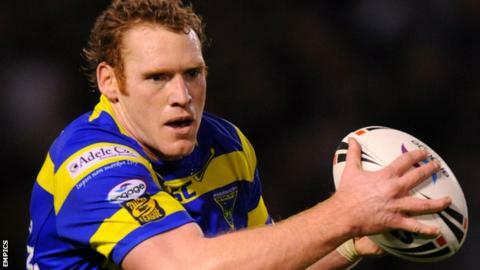 Winger Joel Monaghan ran in a hat-trick as Warrington thrashed Huddersfield. Tries from Monaghan, Chris Bridge and Stefan Ratchford gave the hosts a 16-6 half-time lead, Scott Grix replying for Huddersfield. Monaghan competed his treble after the break, while Richie Myler, Brett Hodgson, Rhys Williams, Ryan Atkins and Chris Hill also went over. They were missing Ben Westwood with a knee injury and Tyrone McCarthy, Chris Riley and Lee Briers after their third Challenge Cup win out of four. Huddersfield were already guaranteed a play-off spot after local rivals Bradford Bulls were hammered 70-6 by Hull FC on Saturday. The hosts did not have the game all their own way and the score was tied at 6-6 six minutes before the break. But Bridge and Ratchford added to Monaghan's 17th-minute try to help give Warrington a 10-point half-time advantage. The home side ran riot in the second half with Monaghan scoring twice inside three minutes to notch up this hat-trick. "We were very scrappy with the ball in the first half but the team did not do a lot of training early in the week. "The skill level was not on the money but the attitude was fantastic and our defence was awesome. "There was only one slip-up and effort-wise I could see how hard we were making it for our opponents. "We completed less than half our sets in the first half but picked up our skills in the second half and I was not surprised about the scoreline once we took control." "The second half was ridiculous but how good were Warrington? We gifted them possession and never helped ourselves. "It was a scrappy game and if we had taken advantage early on it may have been a different story. "We have to dust ourselves down and try to move on and find a recipe to improve. "We have had a disruptive week in training and Matty Dawson only found out at eight o'clock this morning he would be playing but wasn't our worst player by any means." Warrington: Hodgson; J Monaghan, Bridge, Atkins, Williams; Ratchford, Myler; Morley, M Monaghan, Hill, Grix, Waterhouse, Harrison. Replacements: Higham, Wood, Carvell, Blythe. Huddersfield: Eden; Murphy, Cudjoe, Wardle, Dawson; Grix, Lee; Mason, Robinson, Fa'alogo, Ferres, Chan, Lawrence. Replacements: Crabtree, Patrick, Cording, Moore.